"My real life nightmare is playing out over on @ BurgerKing" Tweets Wendy's Social Media PR. If you've been a Burger King Twitter follower - and really, who hasn't - you may have noticed that, at least according to its Twitter feed, the fast food chain was sold to MacDonalds. Except that it wasn't; Burger King's Twitter account was hacked, by a group which may or may not have been Anonymous, and spurious messages Tweeted forth like there was no tomorrow. Burger King has since regained control over its wayward child, and the Tweets have been deleted. While the fun lasted, the entity which had control over its Twitter account posted gems like "just got sold to McDonalds because the whopper flopped =[ FREDOM IS FAILURE," and retweeted every negative comment about Burger King it could get its grubby paws on. 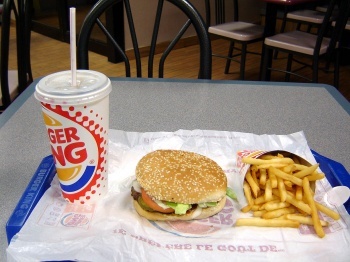 This lasted about an hour, before the keepers of the flame over at Burger King managed to have the account frozen. "We have worked directly with administrators to suspend the account until we are able to re-establish our legitimate site and authentic postings," said Burger King in a statement following the hack. "We apologize to our fans and followers who have been receiving erroneous tweets about other members of our industry and additional inappropriate topics." "My real life nightmare is playing out over on @ BurgerKing" a social media flack over at Wendy's Tweeted, but it's not all bad news for Burger King. If BuzzFeed is to be believed, the fast food chain gained over 30,000 new followers thanks to the hack, though it's likely many of those will melt away now that the fun is over.